A YouTube uploader named A Mishel has done a big favor for Seinfeld fans who want to learn Yiddish.He or she collected excerpts from a few popular episodes of Jerry Seinfeld's long-running sitcom and posted them with the dialogue dubbed in Yiddish and with English subtitles. In this episode, The Bar Mitzvah, Elaine is invited to a young man's Bar Mitzvah and brings a game of Boggle as a gift. 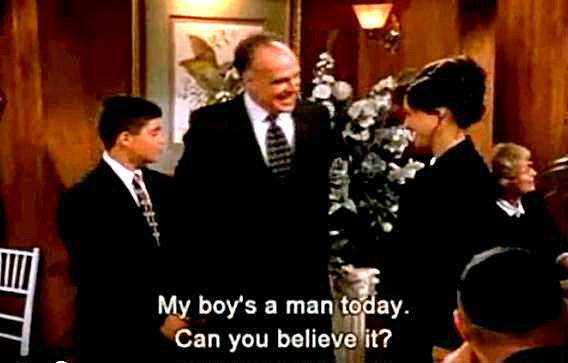 At the reception, the boy's father tells him that now he is a man. Hearing this, the boy plants a French kiss on Elaine. He brags about it to his friends and soon Elaine gets invitations to six other Bar Mitzvahs. From this point on, the issue of what it means to be a man triggers a sequence of funny situations. A lot of Yiddish expressions are tossed about, and the boy's father and even the rabbi get into the act. Really enjoyed this one. Thanks.